One year ago today I started this blog! To celebrate, let's have a giveaway, shall we?! Two other food bloggers that I've followed faithfully, cooked many of their recipes, and plan to cook many more of in the future have written their very own cookbooks. I'll treat one of you lucky ducks to a copy of both! 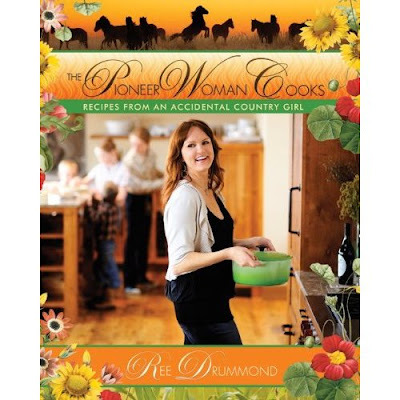 Ree, of Pioneer Woman with The Pioneer Woman Cooks: Recipes from an Accidental Country Girl, set to release October 27th. 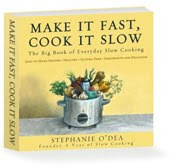 And Stephanie of A Year of Crockpotting with Make It Fast, Cook It Slow, set to release October 13th. For your chance to enter please leave a comment. Need something to comment about? Tell me a recipe you've tried or a recipe you'd like to try that I've posted! For a second chance to enter linkback to this post on your blog or Twitter! Leave a second comment letting me know you've done so! I'll collect all of the entries and announce the winner next Sunday, September 20th. Thank you for the wonderful year! It's been so much fun and I've met a bunch of wonderful people! Happy Anniversary! I thought the roasted banana ice cream sounded amazing!! I can't believe it's been a year! Both of these cookbooks are on my wish list. We love Stephanie O'Dea's Peking Pork Chops. Mmmm. I love your blog Christina and I look forward to reading every post! I so want to get my hands on that slow cooker cookbook! And, as a matter of fact, I have had my eye on the Asian Crockpot Pork recipe on your blog. I really really want to try the lemon sorbet recipe you posted on Friday September 4th. YAY!!!! Congratulations! I always enjoy checking out your site, and I'm so happy to celebrate your blogiversary with you. P.S. I just tweeted about your giveaway. I'll try to link back too, assuming I have another post in time to do so! I have enjoyed reading your blog. As you know, you were the first person who commented on my blog, so I'll always be a reader of your blog. I think the funniest thing you posted was the eggstracter thingy where you and Johnny tried to do push the egg through it. I laughed so hard at that! Those are 2 awesome books!! I love Rea from Pioneer Woman Cooks! I'd love to try the crustless apple pie. It's only been one year?! Wow! CONGRATULATIONS, my dear Christina! Happy blogavesary~ Isn't it crazy how fast time flies by? Let's hope that there are many more years in the future! I'm gonna have to go with your BBQ pomegranate ribs. I'm a sucker for pork. wooohoo!! Congratulations on your 1 year blogoversary!!!! OK you made this one a tough one (to pick through all your recipes Christina!)! I have to say that i am a sucker for your pulled pork recipe you posted about like, 4 months ago. It's been hanging at the back of my head and i can't pass a piece of pork without thinking i need to make that recipe soon! Life's just been too chaotic for new experiments recently, but...who knows?? the day may come very very soon! I pledge that if i win this, i'll make that recipe for SURE! I MUST make the Cheesecake Ice Cream very, very soon! I am a lover of Cheesecake and Ice Cream! Sounds deeeeeelicious! Heyya, Congrats on the 1 year! Im a major coffee girl, after seeing the recipe for coffee bean icecream, i think i may have to try it! Its just do darn hard to find a good Coffee Icecream! Will also Tweet this and leave it in another comment. Have a great day and be roud for making a year! Wow, two of my favorite food blogs and their cookbooks....but I see just from the coffee ice cream recipe, I'm going to have to add you as well!!!!! Currently living in a place where the most exotic ice cream around is Raisin Rum and it's just not my thang! I will try this this weekend! I want to try the Stuffed Acorn Squash and it is almost that time of year. And now, based on Maggie's comment that she would try ANY of your crockpot recipes (and because I am a lazy cook) I'm going to browse through your archives some more. Happy Blog Anniversary! I've had such problems leaving comments lately on blogspot and blogger! 4 days and counting! Yahoo! I think I am going to make pizza as an appetizer - good idea? I just linked back. Congrats to you once again!! happy anniversary! I am new to your blog but will definitely be checking your recipes out! HAPPY BLOGIVERSARY!! I adore all of your recipes (seriously!) and your kindness!! Congrats on one year of tasty posts! I'm going to try the sweet potato fries tonight. It's the right thing to do! i can't wait to try the sweet potato fries! You don't sound like a procrastinator to me! Now I am the Queen of Procrastination! I overthink everything and if I can't make it perfect in reality and/or my mind, I just don't do it. If I do, I usually don't like it. I know, I know...it's a bad problem. But don't you feel better now? See, I knew you would! I think I will enjoy your blog for a while since I found it on PW. Thanks for the giveaway! i think the chicken under a brick sounds so interesting!! thanks for the chance to win a cookbook. this is my first year homeschooling my kids and it's been a challenge to juggle everything. The slow cooker cookbook is just what i need!! :-) bye for now.